Day dresses were common garments in every woman's wardrobe during this time period. The average woman had a couple of day dresses in addition to one they wore out for shopping or visiting. Sunday church dresses were only worn on Sundays. 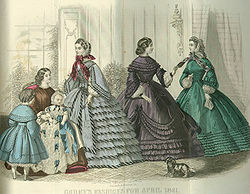 Petticoats and pantalets were undergarments while cover and privacy slips were standard as well. Wealthy women during this era were known for splendid ball gowns. Silk and taffeta were popular choices of fabric for formal gowns. Corsets and wide hoop petticoats were fashionable, especially in the South. Dress hoops took five yards of fabric to make and used whalebone as supporting structures. White gloves and dainty lace-up boots were the style with all dress including formal wear. Dressing for inclement weather was part of making a fashion statement during this era as well. Parasols for keeping sun or drizzling rain away or the ever-fashionable bonnets were used as measures for the weather and as stylish accessories. Jewelry and accessories were lockets and flowers most of the time, especially in the latter year or so of the war. Many women placed a lock of hair from a loved inside their lockets, especially the hair of their soldier sweethearts or family members. Women’s hairstyles were kept in place with hair pomades and oils, and often times by wearing a snood or bun cover. Women parted their hair on top straight down the middle, where it would fall down over their ears in a smooth, waved, or braided pattern. It was then styled in back by pinning the rolled piece of hair or bun resting low on the back of the neck. Shoes worn with dresses were in many cases the same for both everyday and formal, especially for women that were not wealthy. However, the war caused this to be so for many wealthy women as well. European style lace-up boots were the greatest fashion, but many women were forced to wear the uncomfortable styles made with coarser materials due to financial strains caused by the war. Overall, despite the trials and tribulations women during this era went through, they dressed in stylish presentation and were always graceful about taste. Many women today would not have the patience to get dressed in the late-1800 ways with tightening corsets and measuring the number of hoops you would need for a particular dress. 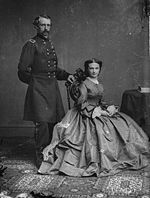 Learning more about post Civil War ladies fashions can also allow you to learn more about the persona and strength of the women during and after the Civil War.